Helping people to share and use knowledge is central to the success of a knowledge management system. However it is just not enough to have people who are willing and enthusiastic to share and use knowledge. What will you do when you have everything but clues in a treasure hunt? Not much, I guess. It is important for the top management of a company to set the direction and make people aware of the purpose of the whole effort and the way forward. Sharing and using Knowledge can be very loosely understood if the purpose is not clear for people. What the system is set out to achieve must be answered in unambiguous terms. There cannot be many different purposes for a KM system but to harness knowledge assets that a company possesses to enhance business performance and achieve greater growth. But how well this message is carried across to people is important. It should clearly spell out that the KM system is in place for the common good and rewarding for all stakeholders. Efforts should be made to make people understand that it is a friendly system that encourages rather than the one that forces people to use it. When a KM system starts from here in unambiguous terms, it will have more passengers with it than is the case otherwise. Start it with a bang and make everyone aware of the KM mission. Once people see the purpose half the job is done. But then not all that people know are important or needed by a company. There will be a chaos and waste of energy and effort if the focus is not set. A KM system in a company could have multiple focus areas but then not all will be focusing on everything. Depending on the role people / departments play and expectations of the management focus should be set for different groups and individuals. More details within each focus area would further help people to come forward and contribute to greater benefits of the organisation. Purpose is clear and focus is there, can people still get it wrong. One is tempted to assume that people will know what to contribute. But then it's worth the time and effort to clarify what knowledge is, to people who matter since the term knowledge is often used in a very broad sense. KM literature is full of definitions of 'Knowledge' and how it is different from data and information. It is important that Knowledge as claimed should be actionable and result in benefits for the organisation. 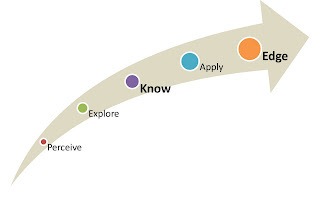 The diagram given alongside captures the knowledge gaining process and when the edge can be gained. If knowledge, as claimed, passed through the above process and passes the 'actionable and benefits' test then it will sharpen the competitive edge of an organisation. This is another great post, I liked your insight that effective knowledge management systems should filter for actionable and productive content; and the fact that there should be a focus for a meaningful generation of the body of knowledge within a business and management structure. In this respect it goes without saying that knowledge in itself is not of much utility. You should be in a position where you make use of it. So, in every business, the fact that people have to act instead of just sharing information and direction is a great challenge. I find that Moria Levy in her blogpost, Encouraging the doing addresses this question quite comprehensively, and comes up with listed tips that ensure that action is enabled at every level. Knowledge Management is actually a fascinating topic- I enjoyed reading about its development, The Momentum of Knowledge Management, where I found this wonderful image of its development. I know I have given too many links already, but I simply cannot resist this. ADB discusses its approach to Knowledge management where there is an image of The Pillars of Knowledge Management which gives you a macro view of the impact of Knowledge Management. I enjoyed reading your article, and found much food for thought.